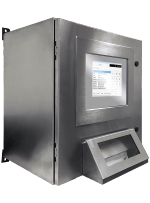 The AutoTouch™ data collection system is perhaps the most intuitive, user-friendly truck scale data collection system on the market today! The system operates real-time from a local PC or mapped network connection. Therefore, transaction data is available for review immediately after the transaction is completed by the driver. The large touch screen color monitor provides drivers with an easy to follow prompt sequence and drop-down lists to select their responses. Typical prompts include Truck (each truck is tied to a “Hauler Account”), Job and Material. Trucks can either be identified by the driver entering a unique Badge ID/PIN# or by other methods such as bar code, proximity card or RFID technology. Because the system is PC based, it is even possible to preassign Job and Material entries to each truck so that these items do not need to be answered by the driver. Once all of the questions are answered, the driver is presented with a Summary Screen where they can confirm or change their entries. Pays for itself in 18 months on average – that’s a 2X ROI in less than 5 years!